In a recent sermon, Current News & How Much Time is Left? (7-21-07), I read a report about a fantastic new weapon the Unites States is perfecting. In a class of its own, the airborne weapon uses a powerful laser beam mounted in a 747 jet airplane to instantly destroy enemy missiles and rockets. As I mentioned in the sermon, this changes all future warfare. The power of a laser light beam is instantaneous because it travels at the speed of light—186,000 miles per second. There is no defense against such an accurate, deadly weapon—no time to react or fight against it. All other weapons are rendered obsolete. Fighting against such a weapon would be like going to war with bows and arrows against atomic bombs. “So the Lord scattered them abroad from thence upon the face of all the earth: and they left off to build the city. Therefore is the name of it called Babel; because the Lord did there confound the language of all the earth: and from thence did the Lord scatter them abroad upon the face of all the earth” (Gen. 11:5-9). But today we are in the last days—and you can be sure that God will no longer restrain men in what they imagine to do, or in the weapons they devise under Satan’s inspiration. After one member heard this particular sermon, he sent us this artwork of the official insignia of the “Airborne Laser” unit that is testing this futuristic weapon. 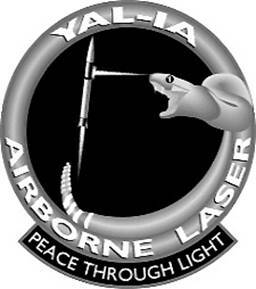 As you can see, the emblem depicts a serpent shooting a laser beam at a missile. The serpent—an obvious symbol for Satan—apparently gives the weapon its power. The motto Peace Through Light certainly hearkens back to Genesis 3. And Satan does appear at times as an angel of light. Remember, Jesus said that conditions in the last days would become so perilous that only His return could stop the downward spiral—or no flesh would be saved alive! One final thought: Once this powerful weapon is perfected by the US, will the nations demand that it be controlled by a “world body” as opposed to a single nation? Will the Beast ultimately control this weapon, so that “no one is able to make war against him”? (Rev. 13:4). As the nature of warfare changes through advanced technology, does this indicate that there is more time left than previously thought? We simply cannot know. Remember what Jesus said, “But concerning that day, and the hour, no one knows, not even the angels of heaven, but My Father only” (Matt. 24:36). It is unclear to me if the USA will be able to actually use the above weapon in warfare. But if it becomes truly functional, I would suspect that the European Beast will ultimately use it. Speaking of warfare, CNN has a three-part series on religious warriors. Last night was titled something like “God’s Jewish Warriors”, tonight is supposed to be something like “God’s Islamic Warriors” and tomorrow night is supposed to be something like “God’s Christian Warriors”. The CNN series seems to be trying to tell everyone that religion, taken too seriously, is very dangerous. Sadly, CNN fails to realize that Jesus taught that His servants would not fight in carnal warfare. Also, I doubt that CNN is going to explain that early Christians would not participate in the military. Those interested in scriptures and historical positions on this subject may wish to read the article Military Service and the Churches of God: Do Real Christians Participate in Carnal Warfare? This entry was posted on Wednesday, August 22nd, 2007 at 6:06 am	and is filed under COG News. Germany moving ahead with its Free-electron Laser: Military applications?